Over 3,000 species of Cockroach worldwide. o German cockroach are an insects that have adopted to man’s environment. o German cockroach can detect and avoid many commonly used insecticides which consumers use but are not effective. o German cockroach can thrive on minute amountts of human food scraps and moisture. 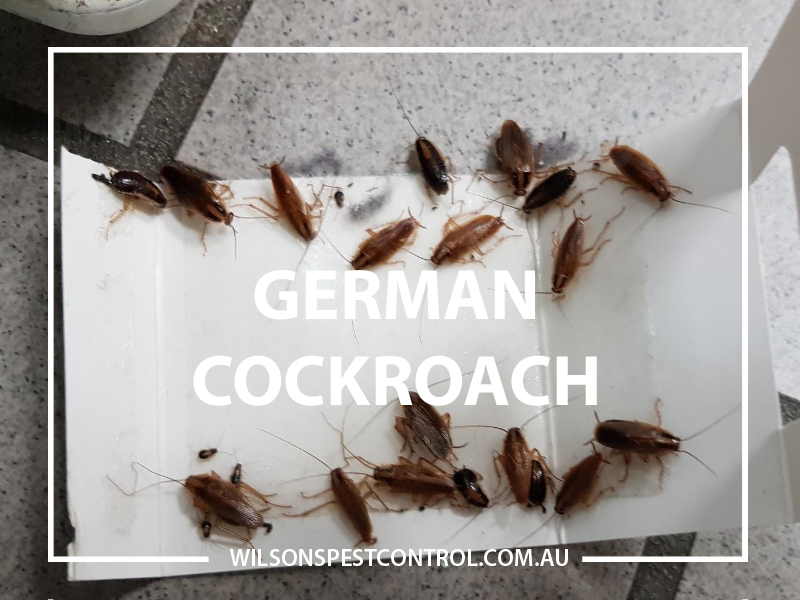 o German cockroach are nocturnal (active at night), excellent climbers and can fit into smallest cracks because of their light and slender shape. o The German cockroach is the major household pest in Townhouse/Units, domestic homes, restaurants, cafes, schools to name a few. HOW DOES THE PEST LIVE & GROW? o Nymphs are smaller but resemble adults, don’t have wings and are quick moving. o German Cockroaches have chewing mouth parts. o German Cockroach remain in dark warm confined spaces and crack when not seeking food or water and they thrive in these conditions. o German Cockroach defecate they leaving small dark brown specks which look like pepper which may be useful in detecting an Infestation. o Thorough cleaning will deprive German Cockroach of their food source. Food splatters should be cleaned up promptly on cupboard doors, stoves, floors back of fridge & seals. o Sealing openings will prevent German Cockroach from the interior of the home and eliminate harbourage. o Avoid allowing clutter of newspapers, magazines, or piles of clothing to accumulate. This will also reduce harbourage. o Garbage should be in sealed bins and moved out of the house in the evening. o Pet food should not be left out continuously, but picked up after feeding. o Repair any leaking plumbing. This will deprive the German Cockroach of water. German Cockroach are mechanical carriers of disease causing organisms. They are capable of spreading many diseases. o German Cockroach can spread food poisoning Salmonella bacteria and have also been implicated in allergic reactions. o German Cockroach have been found to short circuit electrical appliances causing fires and breakdowns in ovens, fridge motors, microwave oven clocks. o Dry do not wipe surface, return personal items and sweep up any dead insects, do not mop or wipe the area to ensure the product sprayed is long lasting.